They run a variety of programs for families with children, including arts, cooking, and nature-based programming, and have drop-in locations around the city. As a community hub, they bring families together so that parents can connect with other parents, children can enjoy a variety of activities and learn social skills – and it’s all free for families! New Westminster Family Place welcomes all families by supporting them with services and resources that empower them to thrive! As we hear more and more about the negative effects of social isolation on mental and physical health, I think that an organization like New West Family Place, which provides opportunities for engagement and community building is well worth supporting! Another non-profit organization that my class worked with this semester was the New West Hospice Society. This is a relatively new non-profit organization in New Westminster that is working “to provide services and to facilitate processes for those in New Westminster experiencing end-of-life and bereavement”. Death and dying are a fact of life, but so often we don’t know how to talk about it or how to support people going through it – both people who are dying and those close to them. The Hospice Society is looking to change that. We will work to build a community where death is no longer hidden or whispered about; where people know what to say and do to be supportive; where residents can die with dignity; and family and friends can grieve well. When my dad died, my mom, sister, and I received a lot of love and support from our family and friends and work colleagues and classmates. But not everyone has that kind of support. The New West Hospice Society is working towards a future where everyone is supported – and everyone knows how to be supportive – around death and dying. And I think that is very important work. This semester I taught a program planning and evaluation class at SFU and the main assignment was for the students to work with a non-profit organization to develop an evaluation plan that the organization can use. So I figure I will highlight the five nonprofits that we worked with as part of my course. First up is the Arts Council of New Westminster. You may recall the ACNW from such things as me being on their board of directors for a few years. The Arts Council is so integrated in the community that they have a hand in pretty much ever event that happens in the city. Fridays on Front Street, New West Craft, Music by the River, Uptown Unplugged, the Cultural Crawl, etc., etc., etc.! In recognition of the great work that the Arts Council does, both the Executive Director, Stephen O’Shea, and the President, Leanne Ewen, won Platinum Awards1 , this year. Stephen won Citizen of the Year and Leanne won the Bernie Legge Cultural/Artist of the Year award! Today was the Annual General Meeting of the Arts Council of New Westminster, followed by its 50th birthday party! For the past 50 years, the ACNW has been bringing community of New Westminster together through the arts and I’m proud to have been a small part of that. I joined the board of ACNW back in June 2014, at the encouragement of my friend, Tig. It was shortly after I finished my MBA and it gave me my first experience of being on a board of directors. 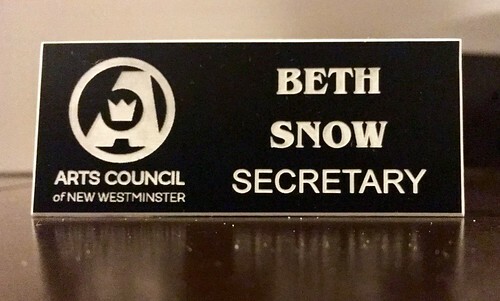 For the past year, I served as the secretary on the board. I got to work with a fabulous group of people, got to contribute to an organization that supports artists in the community and runs many of the amazing events that makes New West such a cool place to be. I learned a lot, made some great friends, and am proud of what we’ve accomplished over this time. I made the tough decision to step down from the board after 3+ years – with my day job getting busier and busier and my new role on CESBCY, I felt like I should not spread myself too thin and that it was a good time to make way for some new blood on the Arts Council board. I will continue to be a supporter of the ACNW, but now as a cheerleader on the side rather than as a member of the board. Looking forward to seeing what amazing things the ACNW does in the next 50 years! Happy birthday, ACNW and thank you to all the artists, art enthusiasts, donors, staff, volunteers, board members, and ACNW members who make it all possible!